The Azcue MN Close Coupled Centrifugal Pump is similar in design to the CP, but a larger, more robust horizontal centrifugal pump with larger flow and pressure capabilities and that can handle higher temperature fluids. Based on DIN 24255, the Azcue MN is dimensionally the same as other pumps allowing it to easily replace existing single stage centrifugal pumps from other manufacturers in applications involving relatively clean fluids such as water and low viscosity fuels. 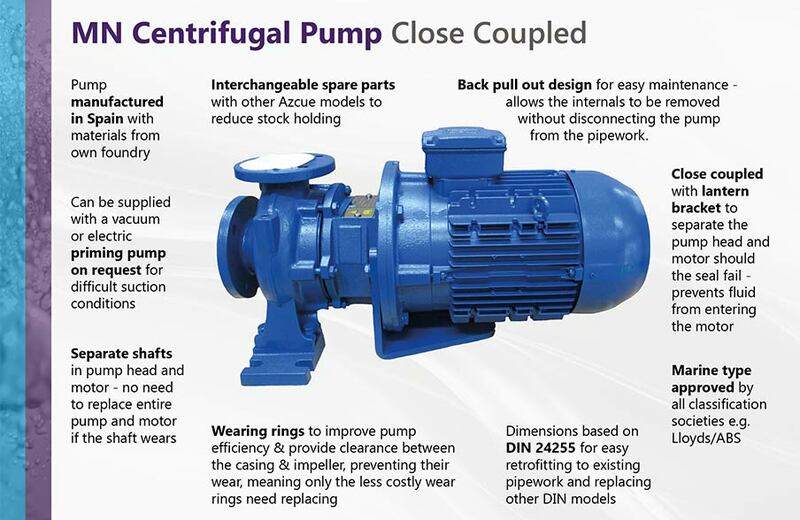 The Azcue MN horizontal centrifugal pump benefits from a back pull out design, allowing the motor to be removed without disconnecting the pump from the pipework, saving time during maintenance. Whilst being closed coupled, this centrifugal water pump has a lantern bracket, which means that whilst being of more compact construction, there is still space between the pump and motor so should the seal fail fluid will not enter the motor. Thanks to the addition of wear rings, there is small clearance between the impeller and pump casing preventing wear to these parts. Wearing rings are designed to be changed every now and then to prevent the more costly replacement of the impeller or casing. These Azcue pumps have separate shafts in the pump head and motor meaning that if there is ever an issue with one shaft, there is no need to replace it all; a benefit over other pumps on the market that have one continuous shaft from head to motor. If required, the MN horizontal centrifugal pump is available with an external vacuum or electric priming pump. For longer suction distances, a vacuum priming pump would be the better solution thanks to its ability to dry run for short periods of time. Castle Pumps understand that the selection process of a pump is the most important part of the buying procedure, so ensuring that we gather the correct information is vital. This information ensures that the customer will get a pump that works, and a pump that's efficient in saving money in both power and spares over it's lifetime. By collecting the necessary information we were able to spec and source the best pump for this customer's needs. Castle Pumps' range is so vast that it includes pumps that other distributors do not have access to. For example, in this case study the client had approached other suppliers who were unable to fulfil their requirement of a self priming centrifugal pump able to handle flow rates of up to 8,300 l/min. Castle Pumps however were able to find the customer a solution.